Info "Stop my spinning face in the right place, will ya?" 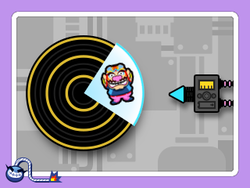 Wario Whirled is the fourth Microgame that is found in the game WarioWare, Inc.: Mega Microgame$! and returns as one of Wario's Mash League microgames in WarioWare Gold. Its name is a pun on the game Wario World. 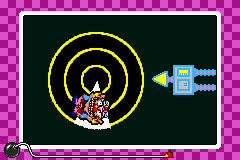 The player controls a machine to stop a spinning wedge with Wario on it. They must press at the right time to extend the arrow, stopping the wedge and winning the microgame. However, if is hit at the wrong time, Wario will fall off of the disk and the microgame will be lost. As the players progress, the wedge will decrease in size, giving the players less leeway in their timing. 1st level difficulty: The wedge is a quarter piece. 2nd level difficulty: The wedge is an eighth piece. 3rd level difficulty: The wedge is a sixteenth piece. Wario Whirled is a recreation of the microgame ROULETTE from Mario Artist: Polygon Studio. This page was last edited on October 5, 2018, at 22:04.